The vaunted College Football Playoff rankings were released for the first time today. I wondered, is it time to start freaking out? When it comes to college football, there is always controversy, however, things seem to take care of themselves. And then teams 1, 2, 4, and 6 lost. The 7th and 8th team didn’t have much of an argument to be in the final game, given they had 2 losses already. Things took care of themselves. The same thing will happen this time around. 1. The SEC Champion is in no matter what. It’s still mathematically possible that the SEC winner has 3 losses. 3. Oregon is in if they run the table in the Pac 12, including the Championship Game. I believe they will do this. 4. Notre Dame is in if they run the table on their season. This includes beating Arizona State, Louisville, and USC. I don’t think they can do this, but it’s certainly possible. 5. If 2-4 somehow disqualify themselves, the next team in is the Big 12 Champion if they only have 1 loss. Since it’s possible that 2 of TCU, Baylor. and Kansas St. make it through with only 1 loss, my prediction is that the winner of the head-to-head between these two teams will make it. 7. A 1-loss team from the SEC: either a team that doesn’t qualify for the championship game, or the loser of the championship game with only 1 loss. I would have completely ignored a 2nd team from the SEC if it wasn’t for 2011, when the SEC had both representatives in the National Championship Game. Another bias that will be prevalent is the Anchoring Bias. The rankings that came out this week really matter. The relatively lower ranking of the Big Ten will be difficult to overcome. The fact that Oregon and Notre Dame ended up where the did mean that winning-out is an easy path to the playoff. 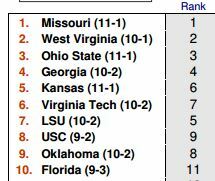 If all teams win, these rankings will largely persist despite very different win quality. I would prefer a system that didn’t do interim check-ins, and rated the teams only at the end of the season (similar to the NCAA basketball tournament).